We have a new project to identify and characterize genes that play important roles in the differentiation, development and growth of plant rhizomes. Information related to that project is available at www.plant-rhizome.org. 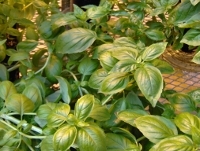 Our research has focused for a number of years on the biosynthesis of specialized metabolites in aromatic culinary herbs, such as sweet basil, ginger and turmeric. We are using these plants in functional genomics investigations of metabolism. What is HLB and Why should you care?